3/92 David Mumpower Were I making a sequel, the plot outline would look something like this. 11/48 Les Winan See what happens when you get good actors and a good filmmaker together for an action film? Take notes, Hollywood. Take note James Bond. 17/55 Reagen Sulewski As close to a remake as a sequel can get; thankfully they started from a good place. 32/126 Kim Hollis Riveting spy thriller. 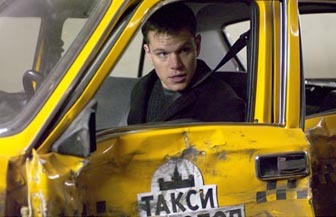 The Bourne films are a lot more interesting than anything Bond is doing these days. The next installment in what Universal is betting will become the Bourne franchise finds Matt Damon’s character in the soup once again. A Chinese vice-premier has been assassinated, and Jason Bourne is being blamed for what is rapidly becoming that old stand-by, an international incident. But as Damon, and the audience, learned in the first film, there is no “Jason Bourne”; that was a cover for Damon’s character, CIA agent David Webb. Needless to say, news that Jason Bourne is running around assassinating political leaders doesn’t set well with Webb’s former bosses at the CIA. It then falls upon Webb (aka The Agent Formerly Known As Bourne) to discover who has usurped the Bourne persona and bring the assassin to justice before relations between the US and China become even more strained and before his former employers catch up with him. All the while, Webb must protect his girlfriend from the first outing, Marie Kreutz, whose life is once again endangered by her association with Webb. The Bourne Identity silenced doubters of Matt Damon’s action-hero potential with its eventual $121 million domestic gross, not to mention the positive critical response. Prognosticators naturally expected Universal to greenlight the second novel in Robert Ludlum’s Bourne trilogy fairly soon thereafter. But something very interesting happened; Universal decided to hedge its bets, waiting to see how Bourne Identity fared in the rental market before proceeding with a sequel. After garnering $93.85 million in rentals so far, Universal appears to have decided that Damon and Bourne could be a franchise after all, and the film was put into production for eventual release in 2004. Franka Potente is reprising her role as Marie, the obligatory love interest. She hasn't exactly been loading up on big budget paycheck movies lately, so perhaps she took this role in an attempt to get her undoubtedly bitter agent off her back. Julia Stiles will also reprise her previous "role" (using that term in the most liberal sense of the word since she had next to no impact in the first movie) as Nicki, the former CIA operative who is suspected by her superiors of aiding and abetting the fugitive Webb. Brian Cox also reprises his role as one of those weaselly superiors. Joining the cast for this outing is the delightful Joan Allen, who will play a high level CIA supervisor with the thankless job of trying to bring Webb/Bourne in. Kiwi actor Karl Urban, last seen as Eomer in the Lord of the Rings trilogy, will play some variant of Eurobaddie.